WASHINGTON, D.C. -- U.S. investors attempting to save for their children's college education are having a tough time reaching their goal, with more than a third (38%) saying they have made "no progress" and 15% saying they have completed their goal. The results lag significantly behind those of other major financial goals set by non-retired American investors, including saving for a home and building an emergency fund. Please indicate where you stand with each of the following possible goals some people set for themselves. About one in 10 (11%) with a child under the age of 18 say saving for a child's college education is not one of their financial goals. Among those who have this as a goal, the 38% saying they have made no progress is the largest number for any of five major financial goals measured in the third-quarter Wells Fargo/Gallup Investor and Retirement Optimism Index survey, conducted Aug. 13-20. 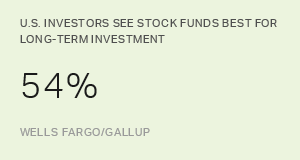 For the survey, U.S. investors are defined as adults with $10,000 or more invested in stocks, bonds or mutual funds, either within or outside a retirement savings account. A report this year from Sallie Mae shows that more Americans are putting away money to help pay for their children's college costs, including an increase in money invested in the 529 tax-advantage program designed to encourage saving for education expenses. However, with the price of a college education continuing to rise, just over a quarter (27%) of investors trying to save for college who were interviewed in the Wells Fargo/Gallup survey can say they either have completed their goal of compiling enough savings for a child's education (15%) or have made a lot of progress (12%). Seventy-one percent of non-retirees have completed their goal of saving for a home -- by far the largest percentage to complete any of the five possible financial goals, with 18% saying it is not one of their goals. The vast majority of those who say they have completed their goal are homeowners. Slightly fewer than one in 10 homeowners say they are still short of their savings goal. Saving for a major vacation has the next-highest total, with 46% saying they have completed their goal, while it is not a financial goal for about one in five (21%) non-retired investors. 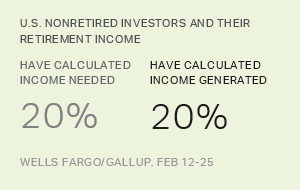 Almost all (98%) investors who are not retired are trying to reach the other two potential goals -- building an emergency fund of three or more months of income and saving enough to live comfortably in retirement. More than half (56%) of those attempting to build an emergency fund say they have completed the task (39%) or made a lot of progress (17%). However, 13% have not made any progress on this fundamental step toward financial security. Only seven percent of non-retired investors have failed to make any progress on saving enough so that they can live comfortably in retirement, the lowest percentage for any of the five goals. On the other hand, this goal also has the lowest percentage at the other end of the spectrum, with only 3% having reached their retirement savings goal. The vast majority have either made a lot of progress (33%) or some progress (57%) on this longest-range of the goals. Saving for retirement is the goal that shows the greatest difference by age -- those 45 and older are more than twice as likely as those 44 and younger to say they have made a lot of progress or completed the goal. Perhaps it should not come as a surprise that saving for a child's college education is the self-reported goal accomplished by the fewest of the nation's non-retired investors. It is a much larger investment than saving for a major vacation and much more costly and a far less immediate necessity than an emergency fund. With the average age of a first-time homebuyer at 33, the need for home-buying savings generally occurs before the need to pay a child's college costs. The situation with retirement savings is more complicated. 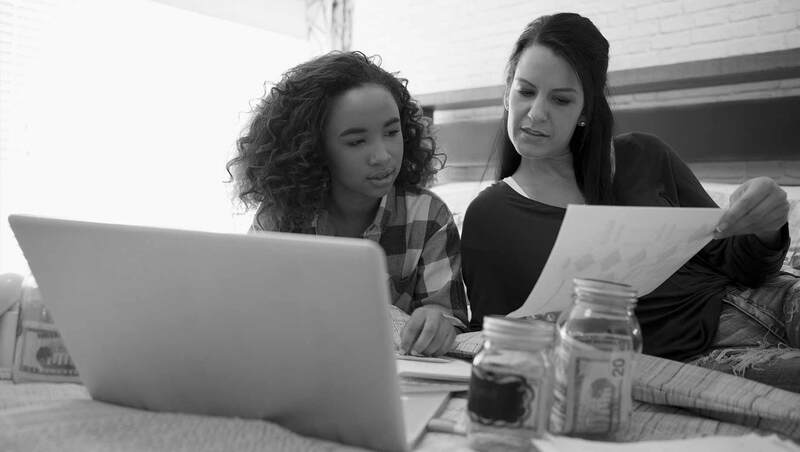 On one hand, the need for retirement funds generally occurs after children have reached college age, which might suggest college savings should take precedence. On the other hand, if college savings goals are not reached, there are alternatives such as loans, but if retirement savings goals are not met, the only alternatives are to not retire or not live comfortably in retirement. Beyond the question of whether investors are giving a higher priority to other savings goals, however, lies this basic fact: One out of every three investors who think they should be saving for their children's college costs have failed to make any progress at all toward that goal. It is a sobering reminder that the specter of college debt continues to be a threat to the financial security of a large sector of the American public. Investors choose stock index or mutual funds over five other investments as best for the long term. Real estate and individual stocks are a distant second.